At last year’s SHOT Show 2017, we were excited to see Inter Ordnance venture into different territory than what they are known. 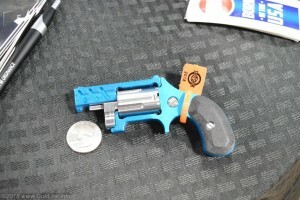 In their booth, they had micro revolvers similar to what you have probably seen from the likes of North American Arms. Until recently, I.O. Inc. was largely known (for better or for worse) for the AK platform rifles which they began producing in the mid-2000s – and which gained a less than stellar reputation for quality and reliability; something with which the GunLink team has had first hand experience as owners of one of their duds. A few years later, I.O. shut down their AK production, moved to a re-tooled production facility, and began cranking out higher quality AKs (and, later, ARs) and started work on rebuilding their sullied name. So when we saw the diminutive .22LR revolvers, dubbed the Valkyrie, in their booth last year, our interest was piqued, despite the fact that they were, at that point, nothing more than rapid-prototyped titanium samples with 3D printed grips with an MSRP of $260 and an expected ship date of last spring. And then… crickets.